For Your Junk Food Lovin’ Offspring: Jelly Bean Soup & Grilled Candy Sandwiches! I wish Michael T had written Jelly Bean Soup and Grilled Candy Sandwiches ten years earlier. then, I would have read it to my son, Tristan, the maybe dinner time wouldn’t be such an ordeal. I have to pay him to eat his salad! Michael T’s first children’s book. Anyway, enough about that! Let’s move on to this jewel of a children’s book! 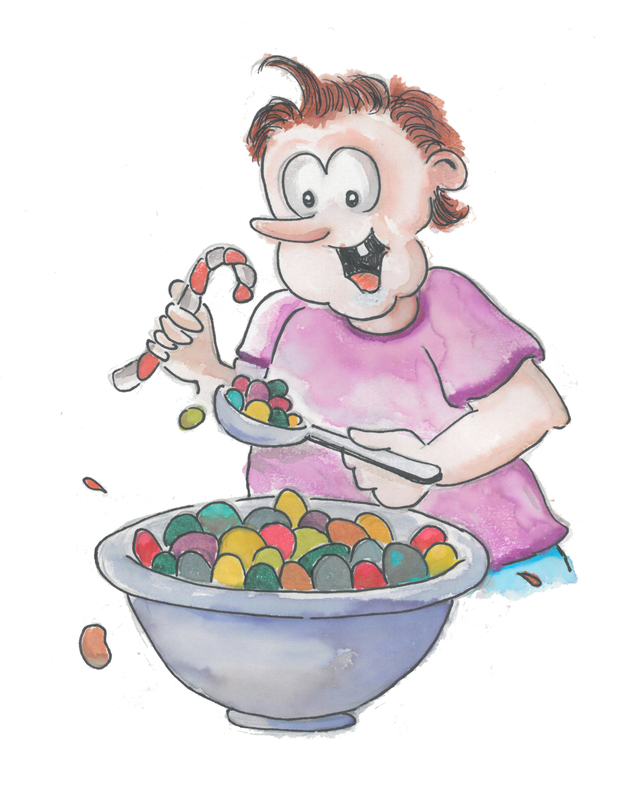 Jelly Bean Soup and Grilled Candy Sandwiches, written by magician Michael T.
I met Michael T last year when he performed a magic show at our church for the children. When I found out he was working on a children’s book, and I told him that I was a publisher, we immediately clicked. Jelly Bean Soup and Grilled Candy Sandwiches is about Mikey, bright young man. But, like many children, he didn’t like nutritious food. Instead, Mikey dreamed of Jelly Bean Soup and Grilled Candy Sandwiches. Sometimes, dreams of such eating habits can lead to hilarious images and inspiring results as told and illustrated in this children’s book written by Magician Michael T and illustrated by Joe Santoro. This book also includes children’s activities for parents and teachers, as well as easy and nutritious recipes that children will love! I’m not kidding when I tell Michael T. that he is my celebrity client. He truly is! Every time I meet him at Panera Bread, people young and old flock to this colorful and charming man. I love him and you will, too. And your children will love Jelly Bean Soup and Grilled Candy Sandwiches! “Michael T” Myers is a graduate of Hagerstown Community College and Shepherd University. He is a Magician, Minister, Motivational Speaker, Emcee, Hypnotherapist, Teacher, Poet, WV Auctioneer #1704 and now a Children’s Author. Michael T. lives in Falling Waters, WV with his beautiful wife, J.J. who is a Nutritionist that always encourages him to eat each meal smarter. With childhood obesity in the news, Michael T. thought this would be a fun project to help children learn a better way to eat and live healthier. Enjoy! You can contact Michael T. at www.michaelts.com, P.O. Box 2955 Martinsburg, WV 25402 or 304-279-2858. SMILE BIG; It’s Free and worth the results! Now, as talented as Michael T is, Jelly Bean Soup and Grilled Candy Sandwiches would never have come to life without the talent of Joe Santoro. Joe Santoro is a graduate of State University of NY at Genesco. He is an enthusiastic Elementary School Art Teacher where his students get excited about learning new creative skills. On the weekends Joe and his hard-working wife, Jane own and operate the “Wonderment Puppet Theater” on 412 W. King Street in Martinsburg, WV. Puppet Shows and Birthday Parties are their specialties. Joe and Jane live in Berkeley Springs, WV. You can contact Joe at www.wondermentpuppets.com or 304-260-9382. Be CREATIVE; Draw what you like and Color. It’s Fun! If you have children, especially if they love junk food, then I strongly recommend Jelly Bean Soup and Grilled Candy Sandwiches for you and your child. Also, if you live in the Martinsburg, WV, area, check Michael T and Joe Santoro’s websites for their next performances. Happy Eating … and Reading! I just purchased my daughter, and her class, a copy of Jelly Bean Soup and Grilled Candy Sandwiches. My daughter really enjoyed reading the book and her 1st grade teacher read it to the class today and it had the students in giggles. Good job, Michael T. Love to support WV authors!!! !